As a patient at Advanced Physical Therapy & Rehab, you will receive one-on-one care from a certified therapist assigned to you throughout your treatment sessions. Our licensed therapists work closely with patients, doctors, and family members to ensure our patients can return to their jobs and active lifestyles as quickly and safely as possible. Whether you are playing sports, driving a vehicle, or working at your job, injuries can happen at any time. 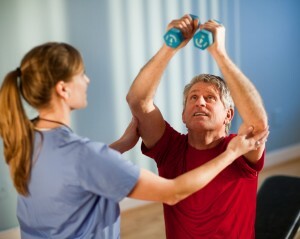 Exercise is critical to regaining your strength after physical impairment or loss of function. At Advanced Physical Therapy & Rehab, we provide a wide array of exercise equipment, including treadmills, stationary bikes, hydraulic equipment, underwater hydraulic treadmills, weights, and more. We treat patients of all ages, from children to the elderly. Therapists at Advanced Physical Therapy & Rehab use many different techniques to help your overall function, including flexibility, movement, stiffness, balance, muscle strength, physical posture, and blood circulation. Our state-licensed therapists will guide you and work with you to help advance your health and ease your pain.